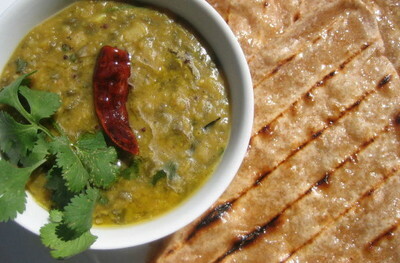 A good dal has to be one of my all-time favourite foods. I’ve experimented with various pulses, spices and aromatics and so far this is my favourite recipe. It is very loosely based on one by Madhur Jaffrey. It’s quite spicy, so for a milder version cut down a little on all the spices, especially the cayenne, and use less fresh chilli, garlic, ginger and shallot. You can also make this with other lentils. A combination of small red lentils and big green-brown ones, or yellow split peas, works well, as the larger ones keep their shape and the little ones disintegrate into sauce. ‘Tarka’ refers to the method of cooking by which piping hot ghee is scented with spices and then thrown into the dish at the end of cooking. If you don’t have ghee and can’t be bothered to clarify butter, use a mix of unsalted butter and sunflower oil. If you don’t have asafoetida or curry leaves, just leave them out. This dal is delicious served with rice or flatbreads. If it’s made quite hot and spicy, I like to serve it with a dollop of full-fat plain yoghurt. You can make the dal in advance then gently reheat it while you make the tarka. Or go ahead and complete the entire dish including the tarka and keep it chilled until needed. Reheat gently and simmer for a few minutes, then serve with fresh coriander leaves.